If you have no time going to the gym, but you want to do something to get stronger and be slimmer, a Bowflex home gym can help you with that. All the Bowflex models are packed with many functions that help you to get a full-body workout at home. Even better, you can do cardio training since they come with a rowing function as well. You will see from comparison chart and reviews below that most of them come with a unique Power Rod resistance. This sort of technology not only provide constant resistance during the motion but also let you change the level quickly. Plus, most of the models allow you to upgrade the resistance in the future. Another benefit of Bowflex home gyms is that you can do a lot of exercises with them. There are no muscle groups you cannot train with them. Even the cheapest model supports more than 30 exercises. And you do not have to worry about the space as they have a compact design. To sum up, if you need a solid machine to work out at home, this cheap Bowflex equipment is a good option for sure. There are cheaper models out there, but you get a long-lasting and versatile equipment made by a trusted manufacturer. Now, check out Bowflex exercise machine comparison and prices below to see what are the differences. Underneath you can read the detailed reviews to get more information. Best Bowflex for the money! It is an equipment that is built to allow a balanced workout because it allows one to perform more than 30 strength exercises so as to strengthen your muscles and perform cardio exercise. This versatile machine helps one to work on the chest, arms, abs, shoulders, back and lower body using the same device as it has a built-in rowing station, triple-function hand grips, four inches upholstered roller, and a horizontal bench press. It uses power rods instead of free weights hence provide a resistance which is much better than the free-weights. They are strong, hence can repeatedly be used without wearing out. You can hook as many power rods as you want to the cable pulley system, i.e. from 5 pounds to 210 pounds of resistance. The power rods are made from high-tech composite materials under high-quality control measures and then they are sheathed and tested 4 separate times so as to ensure durability and quality. A sliding seat rail, which adds aerobic rowing training and perfect for seated leg extension and leg presses. Multiuse hand grip/ ankle cuffs which are designed to add flexibility and performance as you train. Has a workout placard that displays workout descriptions for easier referencing. There have been good reviews for Bowflex PR1000 especially for families and fitness enthusiasts. They say that it is easy to set up and offers various workout options. The main disadvantage of this machine is that you can only go up to 210 lbs if you are weight training. However, this not a problem as most people don’t get to the maximum weight and if they do, they can buy more weight and add. I would recommend this versatile gym equipment for every home, especially if you want to do various exercises without buying a lot of exercise equipment. This Bowflex gym is a complete gym at home that not only acts as a cardio machine but also offers strength training exercises as well and gives out great results in the form of weight loss and muscle gain. What makes it a convenient source of weight loss is that you do not have to spend thousands on it every month and also do not have to go and drive all the way to the gym as it itself is a complete gym at home. You must be wondering with all those new weight loss techniques and programs in the market, why you should invest your money in this Bowflex home gym equipment? What makes PR3000 so special and unique? It is a total body workout machine that not only targets on cardiovascular exercises but also strength training exercises as well. It offers more than 50 exercises so you can have a variety of exercise plans just like you can have at a gym and not get bored. With variations between the sets. It doesn’t even require the change in the cables. Now another question must have arisen in your mind that a machine that can offer so much would take up on a lot of space? No, this is something that outstands the PR3000 with other fitness machines. It doesn’t take much of a space and is made especially for home users. The workout area required is 100” x 78”. It is sturdy and doesn’t move when you are using it. It can weigh up to 210 pounds and can be upgraded to 310 pounds as well. Is this Bowflex weight machine worth it? Let’s see what people have to say about it. The overall verdict of people is that they believe this machine is a great one-time investment. It doesn’t even require that much of a space so anybody can keep it at their home. Few serious gym freaks who have a vast knowledge of different forms of exercises and machines complained that it doesn’t have a lat bar option. Also, it has a complicated warranty structure. But they believe that these cons are outweighed by various other benefits of this Bowflex home gym. With Bowflex Blaze are able to perform over 60 strength building exercise and get to tone the upper and lower body. It has the most efficient tools that allow you to perform many exercises such as the leg curl extension, the last power bar, the sliding seat, adjustable bench and multifunctional hand grips. It has high-pressure resistance rods instead of free weights which can be adjusted up to 210 lbs. or 410 lbs. hence it is enough for those who need some basic strength training. The features of the machine allow you to customize your workouts as to achieve your exercise goals such as losing weight, improving cardiovascular system and strengthening muscles. The device is compact enough to give you the best workouts while at home. Has a free workout placard that you can use for 20 minutes effective training. Customs highly recommend this machine for working out at home. It is very convenient as it doesn’t take up much space of your home. It is safe to use as it doesn’t have any free weights hanging, so you will not worry about getting hurt. This type of the Bowflex home gym is expensive than other products, but it provides more exercise options than the other types. I would recommend this equipment for anyone who has not time to go to the gym, but wants to do full body strength training and doesn’t have money to buy a lot of gym equipment. The Bowflex Xtreme 2SE is for those who are looking for a total body workout especially when you are on a budget and don’t have time or resources to join a gym. It is designed in a way that doesn’t even require much of a space and offers 70 different exercises, all just by being at home. The quality and resistance of this machine is unmatched by any other type of fitness machine available. The best part about this machine is that it comes without the risks of joint pains or any other damages that occurs with free weights. What makes it different from any other fitness equipment is that it is a mini gym that doesn’t require any space as such and is an all in one exercise machine offering various exercises. It is a machine that focuses on all muscle groups of your body for which you do not have to purchase other expensive machines. Other than that, you do not have to change the cable set up to move to a different exercise. Further, being a complete gym at home machine, the Xtreme 2SE Bowflex workout machine also differentiates from other fitness equipment as it has different resistance levels that are adequate for anyone. It has up to 210 pounds of resistance so beginners can challenge themselves and gain muscles as well as lose weight. What makes it even more surprising is that it not only targets beginners but anyone. The resistance level can be upgraded to 310 to 410 pounds meaning it can be beneficial for advanced level gym users too. Overall, the Extreme 2SE can be rated as an excellent source for a fitness machine. The reviews of the customers were favorable, many said that the best feature about it is that it doesn’t have any complex functions and is very easy to use apart from being solidly built. It works best for all muscle groups and is worth the investment. Few minor complaints have also been noted down about the Bowflex exercise chart that is provided with the machine. The complaint says that the chart is printed on both the sides which make them lose around half of the exercises while working out. It provides a total body workout as it delivers an ultra-smooth and consistent resistance through an entire range of motion. It is designed to allow you to perform both cardio and muscle building exercises within a few minutes when compared to other equipment. You can easily and quickly set the interlocking plates from 10 pounds to 220 pounds for the upper body workout. 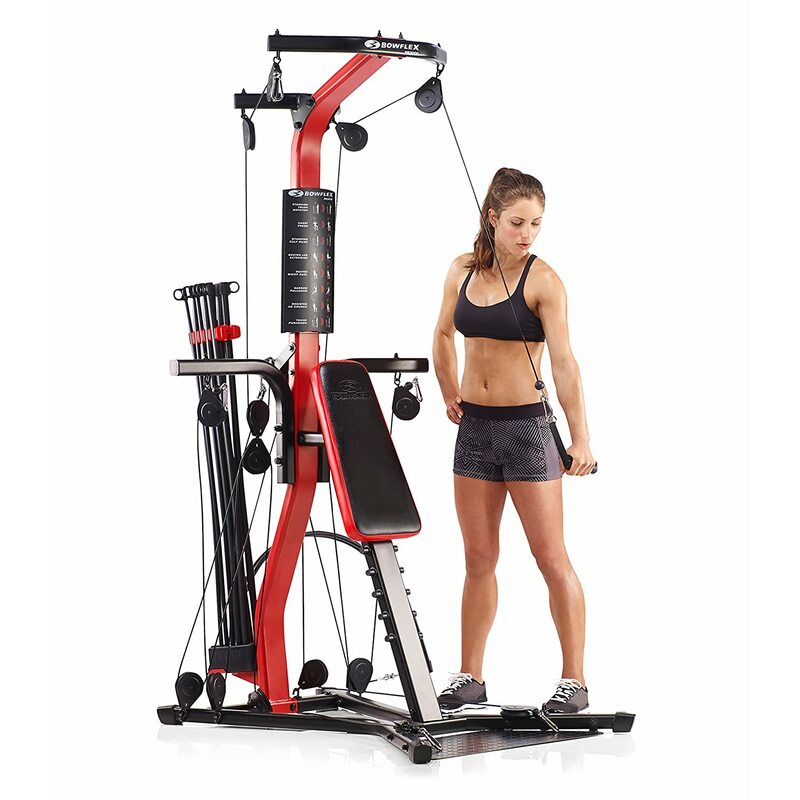 Bowflex Revolution uses the SpiraFlex Resistance Technology which eliminates the need of having heavy weight stacks. It works by using elastic straps that are connected the central pivot coil, and as you exercises, the straps tighten to emulate lifting of heavy weight stacks. Has a manual that guides you on how to set up and use it efficiently. Has a workout DVD that helps you learn what kinds of exercises you can do and also offers helpful fitness tips and complete routines. The machine weight is 157ls (71kgs), and it is foldable hence doesn’t require a lot of space. For people who have bought this machine, it has offered them a lot of help as they do their workouts. They say that the best bit apart from performing a lot of exercises, is that they can adjust the arm to 10 positions so as to strengthen and tone various muscle groups in several ways. It is also perfect for overweight people as it can support up to 135kgs (300 lbs.). The disadvantage that is that it has a higher resistance than other gym equipment, but you don’t have to worry because with time you will get used to the resistance. If you are looking for an all-around gym equipment to help burn fat, build muscles and stay healthy, then buy this Bowflex gym. What is the Power Rod Technology? Why is it good? What is the best buy? Considering the price and the functions, I suggest Blaze from the Bowflex reviews and comparison above. It comes with many useful features, upgradeable and the price is not bad. But PR1000 is still good for beginners. If you need a professional machine Revolution or Xtreme 2SE is maybe the best option for you. What is the best Bowflex machine for weight loss? The equipment above are more suitable for strength training and shaping your muscles. However, thanks to their versatility, you can use them for cardio type exercises. On top of that, a few of them comes with a rowing function which is a great cardio workout. On the other hand, if you are searching for the best Bowflex cardio machine, then the Treadclimber and Bowflex Max Trainerare better options since they provide an efficient fat-burning cardio training. Did you like these Bowflex home gym reviews? Share with your friends! Bowflex PR1000 Home Gym Review | Is It For You? I love Bowflex products, I have a pair of adjustable dumbbells from them, and they are excellent pieces of equipment to work out with. Unfortunately, I have no money to buy a home gym yet, but I’d like a PR3000. Yes, their dumbbells are really powerful. I think the they are the best adjustable weight dumbbells out there. Hi! I’m thinking about getting one of these, but I cannot decide. I’m a beginner and I only want to use the machine for training with light weights. My main way to exercise is running. Which Bowflex gym do you suggest? Will PR1000 do? Yes, if that is the case and you are really sure that you don’t want to lift heavier weights in the future, then PR1000 is OK for you. My friend has PR1000. He mainly runs but he bought it for quick strength training, he likes it. I have someone that will sell me the revolution for 450. I train people in my basement and it’s short ceilings. Should I get it? The height is 83 inches. Measure how tall the ceiling is and add about 10 inches to that.